"She's so different." Radius-TWC has debuted the official US trailer for Severin Fiala & Veronika Franz's Goodnight Mommy, a psychological horror thriller from Austria about a mom and her two insane sons. It's another story about how bad kids can be, but this one is a bit more twisted, involving some really freaky happenings in their nice countryside home. Austrian actress Susanne Wuest plays "Die Mutter", or The Mother, with Elias Schwarz & Lukas Schwarz as the boys. I saw this film as part of New Directors/New Films in NYC, and it's solid and thrilling, but it honestly didn't scare me. Maybe that's just me. Take a look. In the heat of the summer lays a lonesome house in the countryside where nine year old twin brothers await their mother’s return. When she comes home, bandaged after cosmetic surgery, nothing is like before and the children start to doubt whether this woman is actually who she says she is. What ensues is a terrifying observational struggle with fatal consequences on par with The Shining and Dead Ringers. Goodnight Mommy is both co-written and co-directed by Austrian filmmakers Severin Fiala & Veronika Franz, of the film Kern and a few shorts previously. The film premiered at the Venice and Toronto Film Festivals last year. 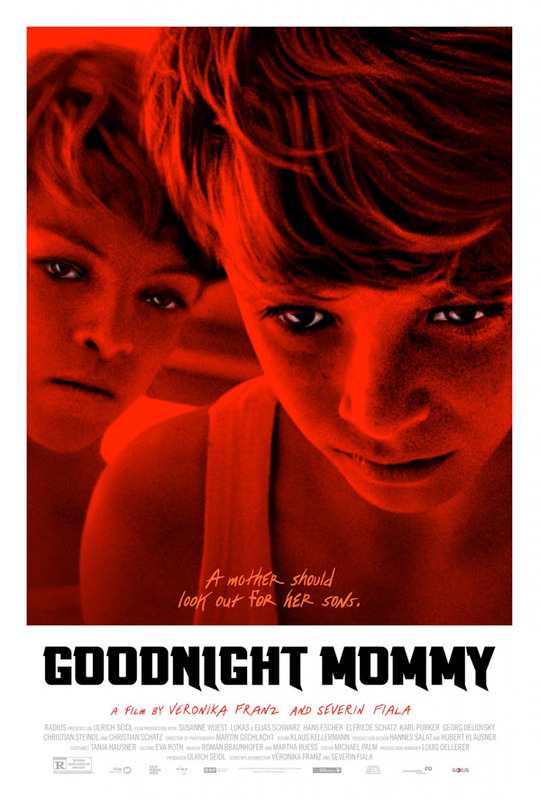 Radius-TWC will open Goodnight Mommy in select theaters starting September 11th. Dammit this good stuff! On my list! This is a must watch for me. OMG. This is the ONE! So freaking good. The cinematography looks outstanding. The tension was palpable! Don't worry, better posters are on the way I'm sure. That one is just an old teaser for the festival circuit when it premiered. They haven't release any official ones here yet, so stay tuned. Well that's definitely better; very slick look, and the font is interesting, too. Thanks for the link.